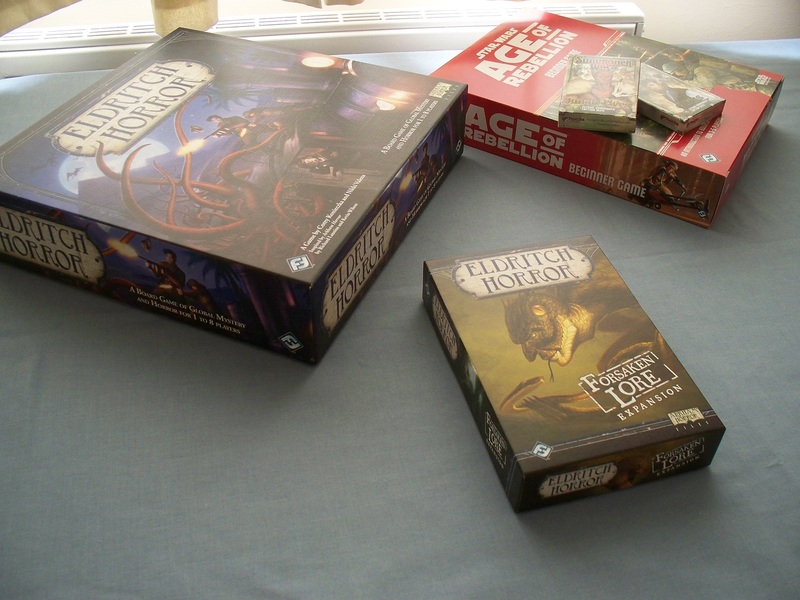 Today, I had a small avalanche of games delivered, and while they were all exciting in their own way, I brushed everything aside in order to get my hands on Forsaken Lore, the newly-released expansion to Eldritch Horror. But, oh my! What exciting new content there is! None of the base mechanics are changed by the expansion, we just get more of the same. 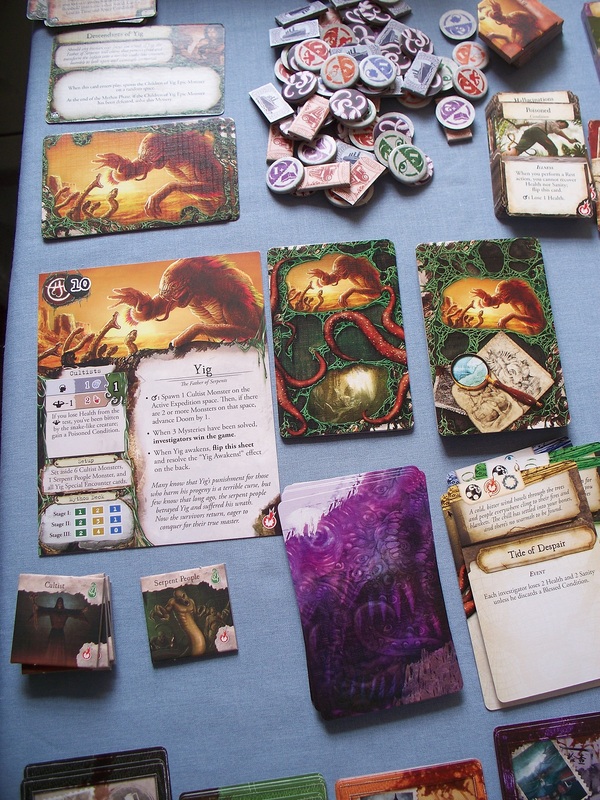 There are still three mysteries to solve, research encounters to have, and monsters keep spawning all over the board to thwart your progress. 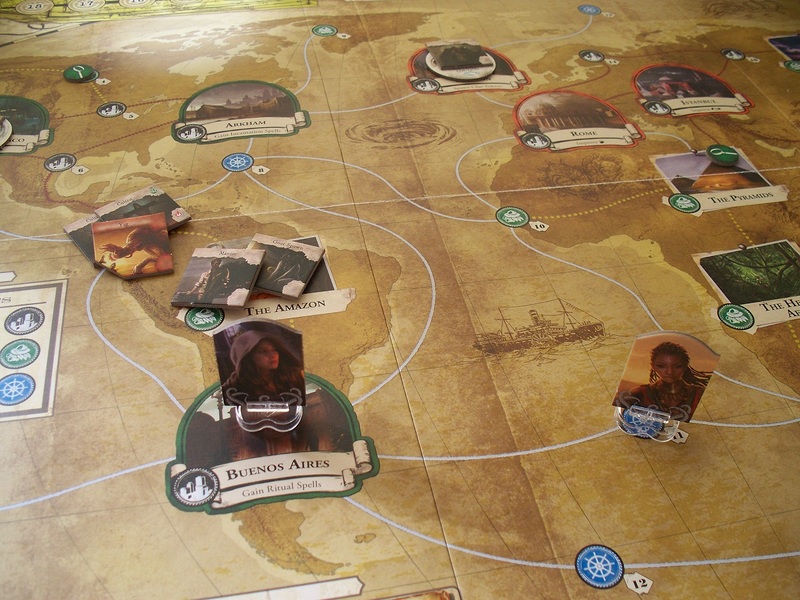 When the expansion was first announced, there was some murmuring as to whether it would provide the blueprint for future expansions, or whether there would be a two-tier process much like Arkham Horror before it, where we get small boxes and big ones. The fact that Forsaken Lore does nothing to significantly alter the gameplay makes me believe that we will, in fact, be seeing big-box expansions that have something more significant within them, notably new heroes. On top of these 250 cards, we have seven new epic monsters, including Yig himself! People were clamouring for new cards to bulk-out the base game’s Ancient Ones, as there were surprisingly few cards for each one to allow for significant replayability. Perhaps one reason why the expansion has come out so soon (barely six months) after the base game itself. While I have only used Yig so far, so have yet to experience the full glory of this expansion by using the new cards for the old Gods, it does look like a whole ton of good stuff waiting right there – in case you hadn’t picked up on it, my first impression of this expansion is AWESOME! Something that I particularly appreciate is the fact that, while there are spells and conditions that are in common with the base game, the effects on these double-sided cards are different. So while a Dark Pact could get you devoured in the base game, here the same card has a different effect if you’re forced to flip it over. Same with spells – I think all of the base game’s spells are reproduced here, but their effects on the reverse are different each time. The work that has gone into this is amazing! I’m also really impressed with how cohesive the snake theme is. 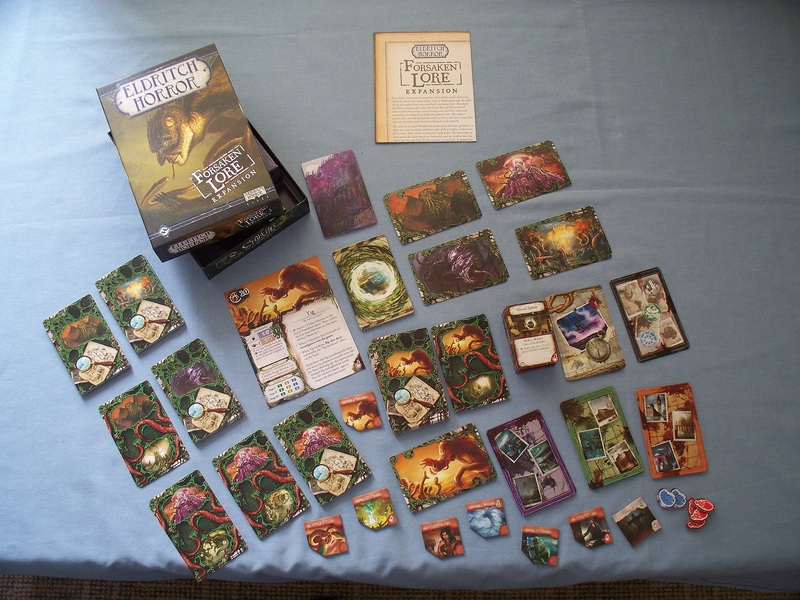 The new location encounter cards have all got some reference to it, meaning for a theme player like myself, you’ll want to keep this content separate from the base game, and while it’s entirely possible to mix everything together before play, personally I think I’m going to play against Yig using only the new encounter decks, to get the full serpent experience! I’m sure you’re all wondering by now how my first game went. I said earlier that the Yig of EH is a little tougher than his AH appearance… by which I mean, I was owned. There is a subtle difference when playing against each of the AOs, of course, and with Yig the first thing that got me was having to go on expeditions a lot more than usual. The three mysteries I had to solve were relatively straightforward: the first, K’n-yan Unearthed, involved having a special encounter, most of which I kept failing, but I got there in the end. Then I had to defeat the Children of Yig epic monster, which was straightforward enough, except that in order to even have a combat encounter you have to pass an observation test, and if you fail, the Children move to another space – which they did for me. I finally defeated them, however at that point the doom track reached 0 and Yig woke up! His Final Mystery involves defeating the epic monster Yig, however I didn’t make it that far. There are 8 eldritch tokens placed on him when he wakes up, and when doom would ordinarily advance, instead one token is removed, until all eight have been taken off and the world ends. 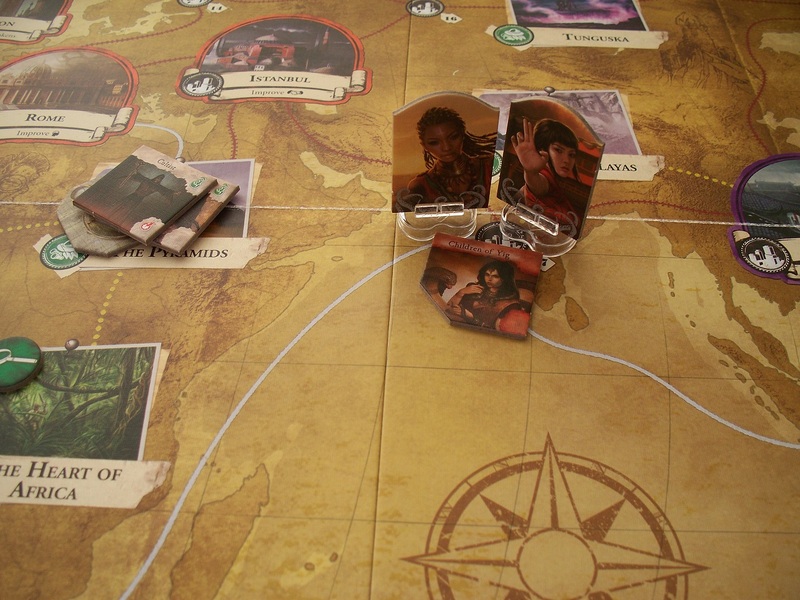 To my credit, I came so ridiculously close I couldn’t actually believe it – the final mythos card forced the removal of the last eldritch token just as my heroes were poised to take the big ol’ snake on! I was gutted like a fish. I’d started the game with Trish Scarborough and Lily Chen, but first Trish succombed to insanity (to be replaced by the hardy Akachi Onyele), then Lily was killed, with Mark Harrigan taking up her place. Yig woke up, and shortly thereafter Mark was also driven insane, and Diana Stanley stepped into the breach. However, the shaman and the redeemed cultist were no match for the Father of Serpents, who promptly devoured the world. Urgh!